1. Fly to St. Maarten’s Princess Juliana International Airport; take a taxi to the base; distance is approximately 40 Min. and cost is 10$/10€ pp. 2. Fly to St. Martin’s Regional Esperance Airport (in Grand Case, French side); take a taxi to the base; distance is approximate 15 minutes. 3. Take a ferry from Anguilla to Marigot Port, capitol of the French side of St. Martin. Every 30 min. 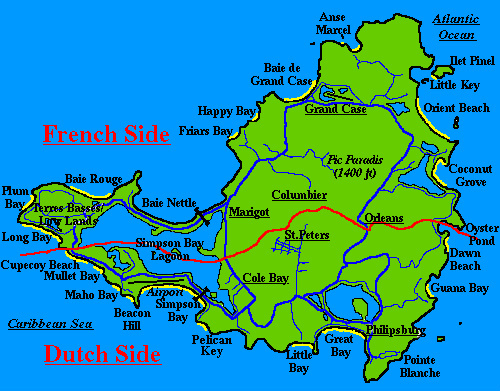 From St.Barths to Marigot daily 7:30am, 11:30am and 5:00pm (Except Wednesday and Sunday arriving in Oyster Pond same hours). On Arrival: A valid passport for each passenger and a crew list is compulsory for clearance. Expiration date must be no earlier than 3 months after your planned return. A customs declaration form must be completed at the port of entry. Departure Tax: The airport departure tax is $35 pp – payable in USD at Princess Juliana Airport. (Esperance Airport: No departure tax). Typically, the departure tax is included in the price of your flight, except for Liat & Winair airlines. At the Marina: Skippers will submit required documentation on behalf his/her crew. dangerous to carry on their planes. If you cannot carry them, leave the CO2 Cylinders behind, call ahead to a chandlery at your destination and have them set aside a CO2 Cylinder, or two, for your arrival. Bring your Inflatable PFD leaving the CO2 Cylinders at home. them in hand). Be sure to unscrew the cylinder (required), put it together with your spare cylinder. are carried onto an airplane (versus those on PFD’s under the seats on airplanes that were inspected by the FAA upon installation). 1. TSA STANDARD (https://www.tsa.gov/sites/default/files/assets/prohibiteditems_brochure.pdf):Self-Inflating Life Jacket- Up to 2 in life vests and 2 spares. The spares must accompany the life vests and be presented as one unit. Both Carry-On and Checked. 2. FAA STANDARD (http://www.faa.gov/about/office_org/headquarters_offices/ash/ash_programs/hazmat/media/hazardous_materials_carried_by_passengers_and_crew.pdf): A life jacket containing two non inflammable gas cartridges plus two spare cartridges in carry-on or checked baggage. (2) I laminate it and keep it in the baggage I am carrying containing the PFD and spare cylinder. (3) I include my cell phone number on the document to allow TSA, FAA or Air Carrier to call me if there is a question. (4) I tell the airline (at the counter to check baggage) that I am carrying an inflatable PFD and spare cylinder. I show them a copy of their website page that allows the CO2 Cylinders. (5) I have checked my bag with the PFD inside and have carried it on.